Members of Palisade’s Tourism Advisory Board (TAB) got 2017 off to a great start last Tuesday, January 10, with a presentation by Bridgett Gutierrez of Cranium 360, the town’s new marketing management, outlining the winter marketing and advertising campaign for the Town of Palisade. Detailed budget spreadsheets were provided and board members discussed with Gutierrez how to fine-tune the distribution of advertising dollars, mainly between print and digital media. After having a chance to thoroughly review the marketing plans for the upcoming year that the Board had put together before Cranium 360 signed on, Gutierrez offered suggestions for a few changes to make the dollars stretch a bit farther. She suggested a focus on agritourism and wineries this winter and to make a bigger push for the mountain biking and recreational communities later, once there has been more progress on the Palisade Plunge and the sport-shooting complex at Cameo. The board discussed the various venues for advertising; print, radio and TV, digital; and which ones best appealed to the different interest groups in the different geographical markets before directing Gutierrez on how to apply the remainder of the winter marketing funds. Local restaurant owner John Sabal was introduced to the Board by Chair Cassidee Shull, along with Ryan Robinson, of Powderhorn Mountain Resort. Both are interested in filling vacant seats on the Tourism Advisory Board and will speak to the Trustees at their January 24 meeting. Also on the agenda for TAB’s first meeting of the year was the election of officers. Jessica Bonds was nominated to replace Cassidee Shull as Chair, with Palisade Chamber of Commerce Executive Director Juliann Adams agreeing to serve as Vice-Chair for 2017. 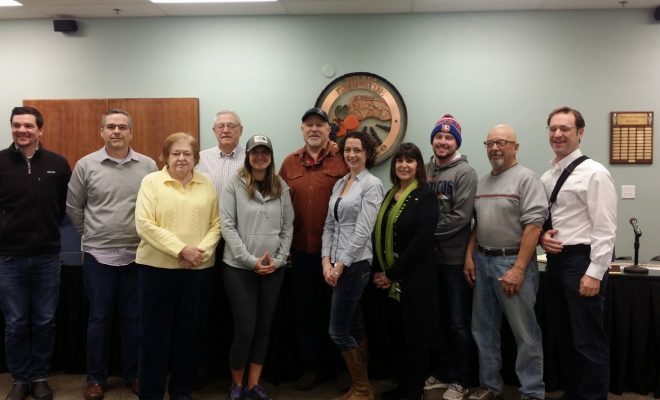 Attending Tuesday’s meeting were Board members Jean Tally, Juliann Adams, Stan Stephens, Charles Talbott, Rondo Beucheler, Felix Iovanni, Jessica Bonds and Cassidee Shull. Ex-oficio member Mayor Roger Granat also attended, as did Town Administrator Rich Sales and staff member Michelle Gossage. The next meeting of the Tourism Advisory Board will be held on Tuesday, March 14, 2017, at noon in the public meeting room of the Palisade Civic Center, 341 W. 7th Street. Meetings re open to the public and an agenda can be found at least 24 hours before each meeting at www.townofpalisade.org, or posted at Town Hall.